Bathroom accessories are one of the most overlooked aspects of your washroom, but you don't want your full-scale remodeling project to fall flat by reinstalling the pre-existing hardware. The right color choice and shape of your new towel bars and holders will make a huge impact to create a contemporary aesthetic in your bathroom. To start, you'll need to decide on a finish for your towel rings and bars. While chrome and brass are traditionally the most popular, there are also brushed bronze and nickel finishes, as well as solid colors like black and copper. Look to your color scheme as inspiration - rustic, traditional designs are better suited to darker hues, while modern washrooms benefit from sleek silver designs. 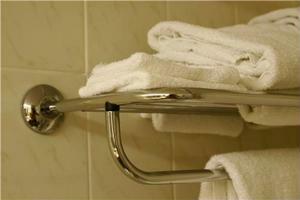 Unifying the designs of your towel rack and rings is essential for creating a streamlined arrangement. An opulent ring won't exactly mesh with a sleek two-bar towel rack design, so strive for uniformity when picking out these accessories. A bathroom remodeling project is a huge undertaking, but finding the perfect mixture of bathroom accents can help you craft a layout that will stand the test of time.